N + 1 = what is your next planned Gretsch buy? What Gretsch is on your near term purchase radar right now? 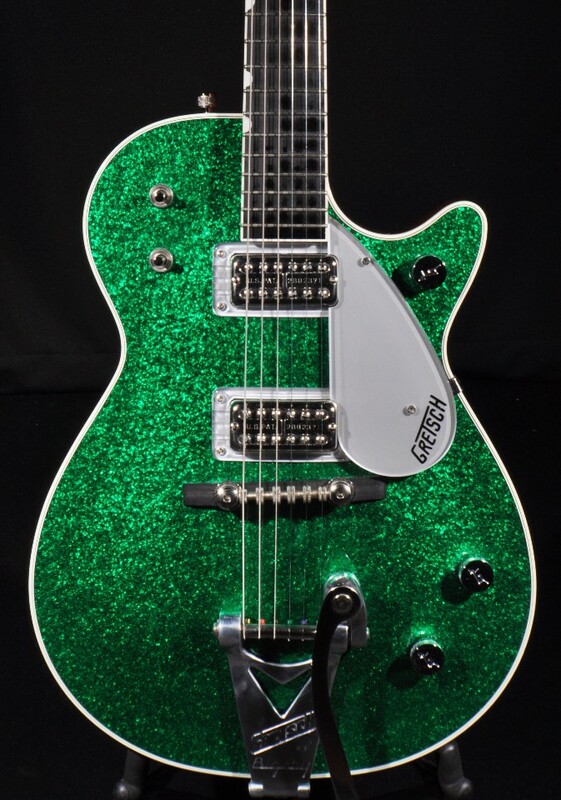 Having fallen in love with my Aspen Green 5420t, in addition to my 6119, I have decided my next Gretsch will an orange one, probably a used 5420t with chrome bits. It seems sacrilegious to not own an orange Gretsch. If it is sacrilegious to not own an orange Gretsch then I guess my next purchase would be an orange 5422. Then I would want to mod it with a TV Jones Classic + or even a Power'Tron in the bridge and a T'Armond in the neck. It may sound weird as a guitar lover on a guitar forum to say this but I'm pretty happy and content with the guitars I currently own and don't see myself buying any new guitars for the rest of my life. I'm waiting for a CVT with Dynas to appear! Joe C said it would happen one day. I'll know it when I see it...uh, play it. Right now a 6120 is the missing link, but I need to try one I would love and afford. It ain't a Modern World Gretsch but I am going for a 3/3 Vette, Twist, (no vibrato) or even Princess... and holding out for the full 1 3/4" nut width. I too am quite happy with my current complement of guitars - not only Gretsch, but the nameless ones as well. If I was lusting for a new Gretsch, it would be the bourbon stain Broadkaster, the similar (but centerblockless) 6620 in orange, or a certain Custom Shop Jet of undisclosed specification. I want a 64-66 Gent that doesn't look like it spent a year soaking in coffee. I would like to find a G5436T in Burgundy quilted maple. It was a FSR for Guitar Center/MF/WW&BW a few years back along with on in figured maple in orange. Haven't seen one on the used market. I don't "need" anything but that's not the point here, right? I'm retiring in three weeks, and my stable is pretty well stocked. Can't really say that I've got a lust for anything else, but I do think of a 6119-62 on occasion. I have an offer out there, it'll take a few weeks to see if it pans out. I keep looking, I have Cows and Cactus...need something more sophisticated in appearance! The G6620TFM has my eye, like the 6120-59LTV did when I purchased the RHH. Congratulations JD upon your impending retirement! You are going to LOVE it! Similar to your situation...I am not really in a "buying phase" at the moment...quite the contrary, I am "down" three guitars in the last couple months! I have my G5120 with TV Classics and my G6118T Annie...and I'm pretty happy with my Gretsch lineup! What I want isn't currently made... namely, a gold or green sparkle 6129 with Filtertrons or Powertrons. I have hollows with Dynas, hollows with Filtertrons and Powertrons, and a Jet-style (6130 Roundup) with Dynas. The only hole in my tone coverage is a Jet of some sort with Filtertrons/Powertrons. For now, the Corvette w/ Megatrons covers that territory, but being a slab, it's definitely different from a Jet in sonic terms. but I'd settle for a nice one in the Blue Pearl. don't need one, want all of them. had i the disposable income, i guess i'd be looking at those fancy new 55 falcons, with the spruce tops and the dynas, praying i like the new neck shape. failing that, a grey/purple club. or a 6122 might be something of a more "sensible" purchase. probably a 62 or a 59.
in a more realistic sense, whatever showed up that was cheap/broken when i had enough money to do something stupid. Thanks Toddfan, I'm really looking forward to it. I'm looking at it as a fresh start in life, with worrying about having to work full time, and just enjoy what I'm blessed enough to already have in life. Those ticks in the clock are getting LOUDER every minute. I bought my latest dream Gretsch (CGP model) only to have it arrive with tons of checking at the neck so I returned it. So my next Gretsch will either be a better-condition CGP or a Harbor Blue Setzer Hot Rod. Well I got my 6120 and replaced my ‘15 Penguin with a ‘06 Duo Jet so I think I’m set....buuuuuut however I’d love to have another Penguin or even a Falcon but in black this time. Very cool! Post pics when you're done. I’m pretty much satisfied now although admittedly do regularly check out what’s for sale. Should something really get my attention, maybe I would go for it but actually plan to go in the other direction in the next 2-3 years. Things I would consider include a husk that could be made into my own. I’ve also considered going for something like a low end Jet for travel purposes. I bought a Corvette for this reason a few years ago but like it so much that it would be upsetting if it was damaged or lost. Edit: A 6122-1958 would probably make my day. Never tried one, but those who have love them and they are hard to find. The big body with 24.6 scale and trestles seems too good to pass up. I'm with Buddy......I have all I need. I know, I know need has nothing to do with it but I have the guitars I've Jones for down through the years so I'm done. I agree with you regarding owning an orange Gretsch, assuming you have a small or even larger collection of Gretsches. My orange Gretsch is Chet's prototype Super Axe so I'm good on the orange front. 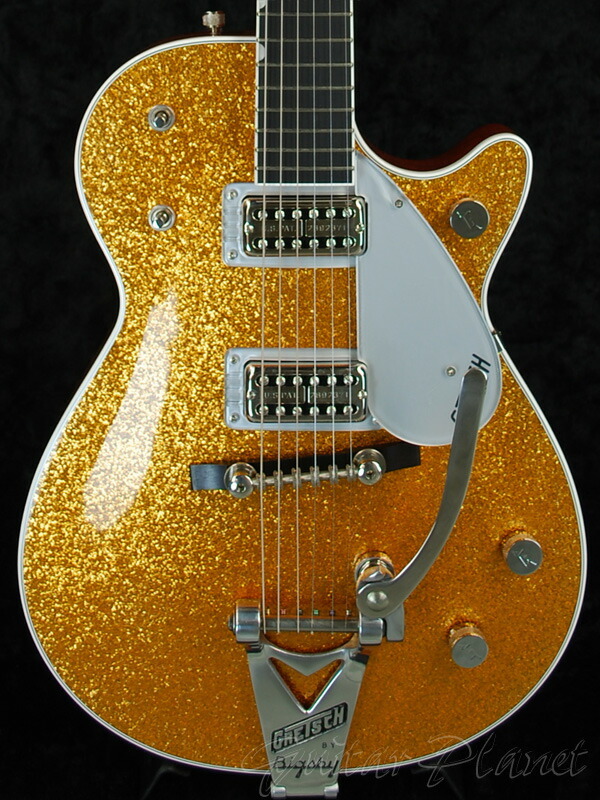 Yes, an orange Gretsch is a must have.